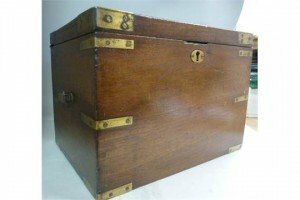 A late 19th century military style mahogany campaign box, with lacquered brass corner and quoin mounts and strap guides, having straight sides, two shallow flank drawers and a hinged lid. 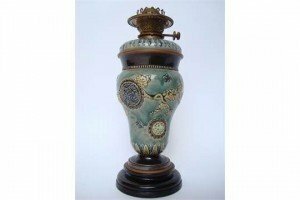 A Doulton Lambeth glazed stoneware oil lamp, of inverted baluster form, decorated in raised relief with flower prunus branches, butterflies and panels filled with perched birds, a coiled snake and a goldfish, on plinth base, impressed marks, fitted with a stoneware mounted glass reservoir and Hinks Duplex burner. 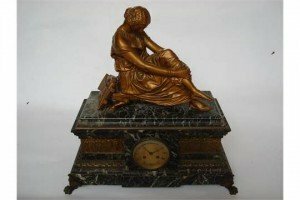 A late 19th Century architectural marble and gilt bronze mantle clock, the sarcophagus form base with central circular engine turned dial with Roman numerals and minute track, mounted with a classical frieze and berried leaf cast border, raised on paw feet surmounted by the reclining figure of Sappho. 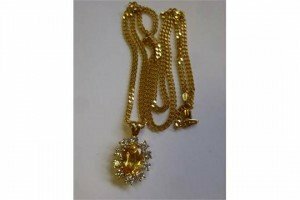 An 18ct gold pendant necklace, having a cluster drop, set with a central yellow sapphire, surrounded by ten diamonds, on a flat curb link chain. 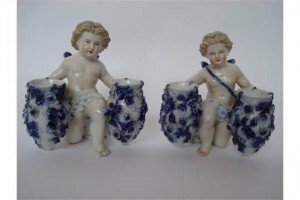 A pair of late 19th Century Sitzendorf figures of putti on bended knee holding a pair of flower encrusted vases, decorated in underglaze blue and colour enamel. 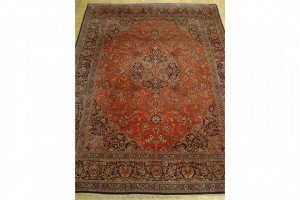 A mid 20th century Kashan carpet, central medallion against a red floral field within palmette and foliate borders. 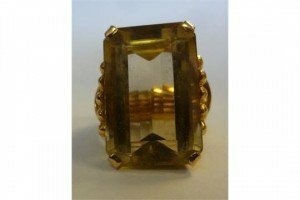 An 18ct gold ring, having a drawn and gathered wire shank, claw set with an amber coloured stone. 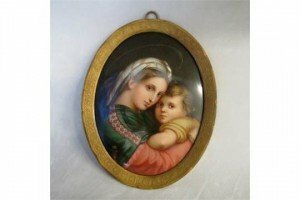 A 19th century Meissen porcelain plaque painted after Raphael with the Madonna and child, mounted in an oval gilt metal frame, bears painted blue cross swords mark. 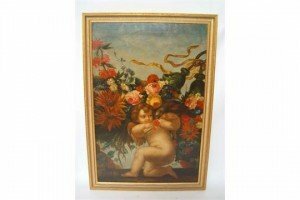 18th Century Italian style, winged putti with a parrot and festooned swags of flowers, oil on canvas, unsigned, gilt frame. 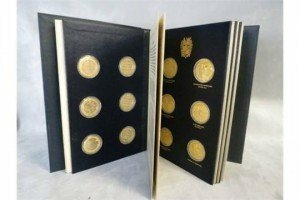 The Churchill Centenary Medals trustees presentation edition set of commemorative silver gilt medals, 24 in total, bound in a presentation album. 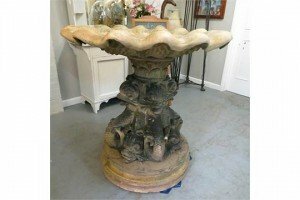 A large period pressed stone sectional bird bath having a shell form bowl over a column support, decorated with dolphins on a circular base. 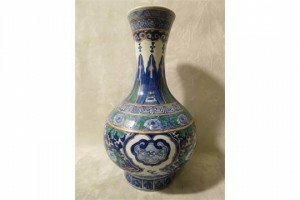 A late 19th century/early 20th century Chinese vase decorated with dragons, Greek key and stylised floral designs, underglaze blue six character Kangxi mark surrounded by twin dragons to base. 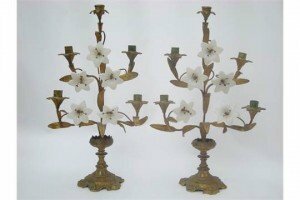 A pair of 19th Century French gilt metal lily spray five light mantel candelabra with opaline glass flower heads, on spreading base. 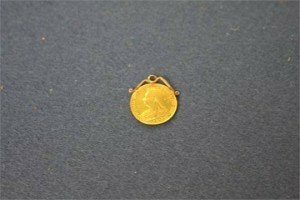 A 1898 Queen Victoria Sovereign, widow head rev. 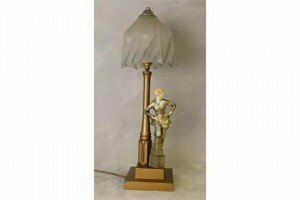 St George and dragon, on a gold mount. 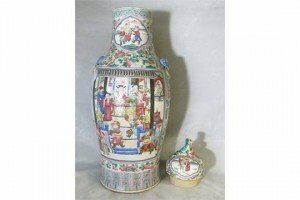 A tall 19th century Canton vase and cover having all over decoration with scenes of warriors fighting, lid mounted with dog of foe. 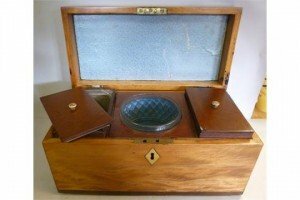 An early 19th Century satin birch and mahogany tea casket, having straight sides and a shell marquetry design on the hinged lid, enclosing a fitted interior with a pair of removable, covered caddies and a central cut glass bowl. 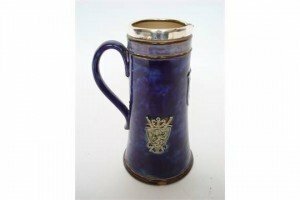 A Doulton Lambeth blue glazed stoneware silver mounted trophy jug, of tapering cylindrical form with loop handle, moulded in relief with a central shield ‘B. 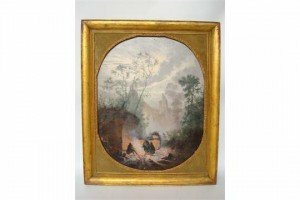 S. A Shooting Cup’. 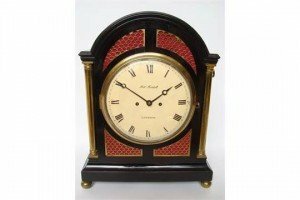 An early 19th Century Regency ebonized and brass mounted bracket clock, the circular 9 inch convex cream painted dial with Roman numerals and minute track. Five pillar rack and bell striking twin fusee movement with anchor escapement, break arch top case with brass carrying handles, arched fish scale fret cut panels to sides and conforming fret infill above and below dial, flanked by brass pilasters to front, on moulded base raised on brass ball feet.